A. Musa, Z., J. Qasim, B., A.K. Al Shaikhly, A. (2017). 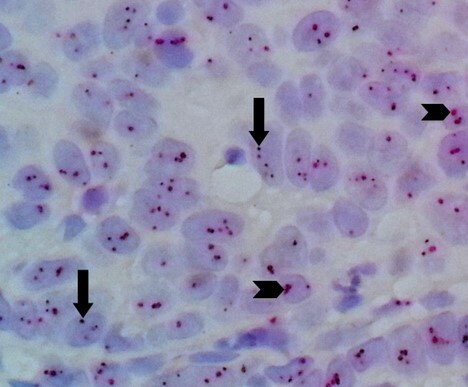 Evaluation of Immunohistochemistry-Equivocal (2+) HER2 Gene Status in Invasive Breast Cancer by Silver DNA in Situ Hybridization (SISH) and its Association with Clinicopathological Variables. Iranian Journal of Pathology, 12(1), 9-19. Zaidoon A. Musa; Ban J. Qasim; A.Wahab A.K. Al Shaikhly. "Evaluation of Immunohistochemistry-Equivocal (2+) HER2 Gene Status in Invasive Breast Cancer by Silver DNA in Situ Hybridization (SISH) and its Association with Clinicopathological Variables". 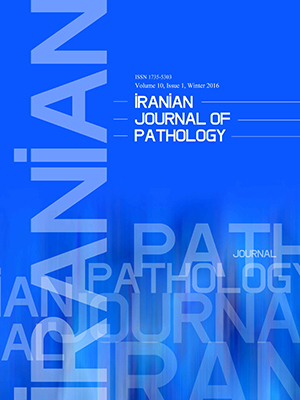 Iranian Journal of Pathology, 12, 1, 2017, 9-19. A. Musa, Z., J. Qasim, B., A.K. Al Shaikhly, A. (2017). 'Evaluation of Immunohistochemistry-Equivocal (2+) HER2 Gene Status in Invasive Breast Cancer by Silver DNA in Situ Hybridization (SISH) and its Association with Clinicopathological Variables', Iranian Journal of Pathology, 12(1), pp. 9-19. A. Musa, Z., J. Qasim, B., A.K. Al Shaikhly, A. Evaluation of Immunohistochemistry-Equivocal (2+) HER2 Gene Status in Invasive Breast Cancer by Silver DNA in Situ Hybridization (SISH) and its Association with Clinicopathological Variables. Iranian Journal of Pathology, 2017; 12(1): 9-19. Background and Objective:Determination of HER2 gene is crucial in breast carcinoma management and prognosis, as HER2 alterations are linked to a shorter disease-free period, overall survival and resistance to tamoxifen anti-estrogen therapy and other chemotherapy regimens, regardless of the nodal or hormone receptor status. 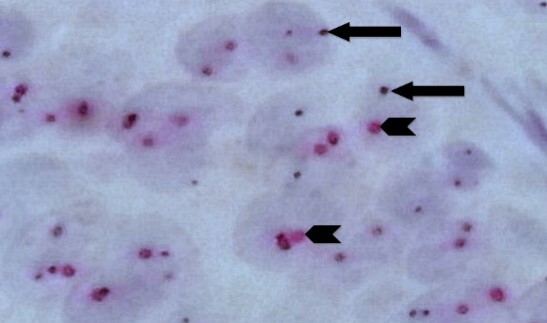 This study aimed to estimate HER2 gene status of infiltrative mammary cancer cases with immunohistochemically equivocal (2+) score using Silver DNA in Situ Hybridization(SISH) technique and to investigate its association with clinicopathological variables. Methods: The study included 52 formalin-fixed paraffin embedded tissue blocks from female patients with invasive breast carcinoma with score of 2+ (equivocal) HER2 immunohistochemistry. All cases were studied by silver DNA in situ hybridization technique (SISH) for the determination of the amplified HER2 DNA. Results: TheSISH technique showed that HER2 gene was not amplified in 33 cases out of 52 (63.5%); while the rest of 19 cases (36.5%) revealed amplified gene status.According to age, HER2 gene status reported non-significant difference in the age groups between cases with amplified and non-amplified gene status (P=0.173). There was a significant negative association between positive Estrogen (ER) and Progesterone (PR) status and HER2 gene amplification (P= 0.002 and 0.017, respectively). Conclusion: More than half of breast carcinoma cases with equivocal HER2 immunoreactivity showed non-amplified gene status; this needs to be considered by oncologists in their management planning of breast cancer. Amplified HER2 gene is significantly associated with negative ER and PR status that affects patients’ management protocols and future outcome of the disease. Breast cancer is one of the most common causes of death, worldwide. The increasing incidence of breast cancer and its associated mortality highlight the need for new therapeutic development, especially targeted treatment (1).The course of breast cancer is influenced by several prognostic parameters, including histological type and grade, tumor size, proliferation index, lymph node status, lymphatic and vascular invasion, Estrogen (ER) and Progesterone (PR) receptor status etc. (2). Amplification of HER2 gene is associated with rapid progression of the disease, increased metastatic potential and resistance to tamoxifen. The discovery of targeted therapy against the HER2gene (Herceptin) has brought an effective treatment modality for breast cancer patients (3).Immunohistochemistry (IHC) is the most frequently used, convenient and cost-effective initial test for HER2protein expression. HER2 IHC results are generally divided to four scale scores (range, 0 to 3+), depending on the percentage of positive tumor cells and staining intensity. The US Food and Drug Administration (FDA) recommends that HER2IHC scores of 0 and 1+ must be considered as HER2 negative and those with HER2 (3+)scores should be regarded as HER2positive while HER2equivocal invasive breast cancer are those with HER2 (2+)score. This has to be further assessed by Fluorescent In Situ Hybridization (FISH), which is more accurate and reliable than IHC. However, the need for a skilled operator, long procedure, special equipment, and difficult preservation of slides for later review are the disadvantages (4).A fully automated method, Silver In Situ Hybridization (SISH) may overcome the disadvantages of FISH and it has the same accuracy of FISH. It is performed by counting black signals, which are dot-like on the conventional bright field light microscopy (5). “Advantages of SISH include high sensitivity for detection of single gene copies, quantifying DNA targets with high resolution, and tissue counterstaining with high contrast for visualizing the signal separately and determining tissue morphology” (6).The aim of the present work was to estimate HER2 gene status of infiltrative breast cancer cases with immunohistochemically equivocal (2+) score using the SISH technique and to investigate its association with some clinicopathological variables including age of patients, type of breast cancer, and ER and PR status. Fifty-two formalin-fixed paraffin embedded tissue blocks from female patients with invasive breast carcinoma with score 2+ (equivocal) HER2 immunohistochemistry were collected during the period from September 2013 to October 2015. All cases were studied by Silver DNA In Situ Hybridization technique (SISH) in a private pathology laboratory to determine the HER2 gene amplification status; amplified versus non-amplified.All cases were already studied by the immunohistochemistry technique in the same laboratory for ER and PR status; positive versus negative.Correlation of HER2 gene status by the SISH technique was made with different parameters including: age of the patient, type of invasive mammary carcinoma, and ER and PR immunoreactivity.Other clinicopathological information including tumor size, stage and lymph node status were not available, because the specimens included in the present work were incisional biopsies. All of the cases were moderately differentiated. Immunoreactivity for all cases for HER2, ER, and PR was studied by the VENTANA- BenchMark-XT computerized automated system, using the ultraView Universal DAB Detection Kit. Four-micrometer-thickness tissue sections were used. 1- HER2 rabbit monoclonal antibody (clone 4B5). 2- Estrogen receptor rabbit monoclonal antibody (clone SP1). 3- Progesterone receptor rabbit monoclonal antibody (clone 1E2). The ultraView Universal DAB Detection Kit detects specific mouse and rabbit primary antibodies bound to an antigen in paraffin-embedded tissue sections. 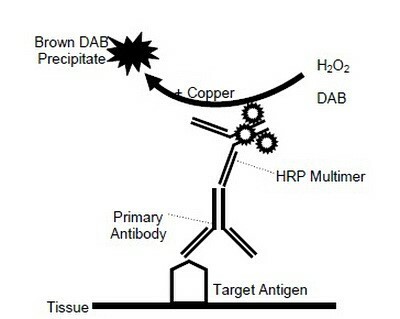 The specific antibody is located by a cocktail of enzyme labeled secondary antibodies (HRP Multimer). The complex is then visualized with hydrogen peroxide substrate and 3, 3’-diaminobenzidine tetrahydrochloride (DAB) chromogen, which produces a brown precipitate that is readily observed by light microscopy. The principal steps of the procedure is illustrated in Figure 1. The staining protocols followed for all three immuno-stains (HER2, ER, and PR) were in accordance with standard staining protocols of VENTANA- BenchMark-XT computerized automated system for each antibody. The immunohistochemistry results and scores were recorded independently by two pathologists, followed by a common review for agreement. The immunoreactivity criterion for inclusion of all the cases in the study (HER2 score 2+, equivocal) was weak-moderate complete circumferential membranous staining in >10% of invasive cancerous cells. Fig. 1. UltraView Universal DAB Detection Kit Reaction. The immunoreactivity criteria for evaluation of all the cases in the study for ER and PR were in harmony with Allred method. Allred scoring system is a combination of proportion score and intensity score. Proportion score is a scale of 0 to 5 (0: no reactivity, 1: <1% of tumor cells, 2: 1-10% of tumor cells, 3: 1/3 of tumor cells, 4: 2/3 of tumor cells, 5: >2/3 of tumor cells). 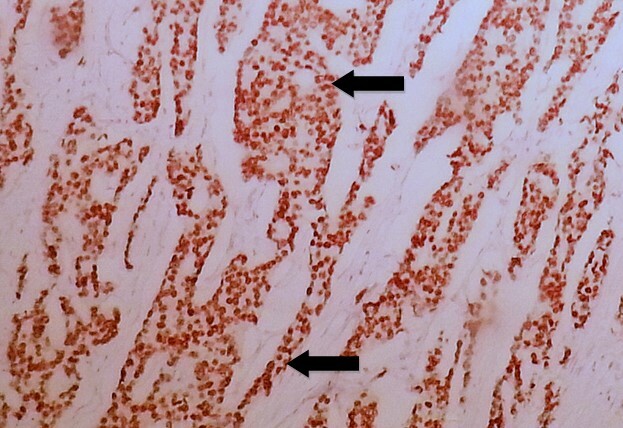 Intensity score is a scale of 0 to 3 (0: none, 1: weak staining, 2: moderate staining, 3: strong staining). The Allred final score value will fall in a range of 0 to 8; score of 0 to 2 was considered a negative result, and score of 3 to 8 was considered a positive result. 1- INFORM HER2 Dual ISH DNA Probe Cocktail: contains a cocktail of HER2 DNA probe and chromosome 17 DNA probe. 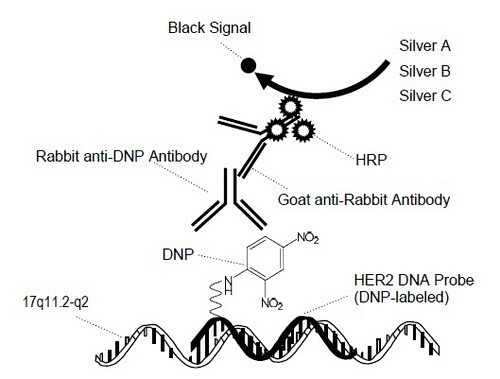 2- ultraView SISH DNP (dinitrophenyl) Detection Kit: detects the HER2 DNA probe sequence. 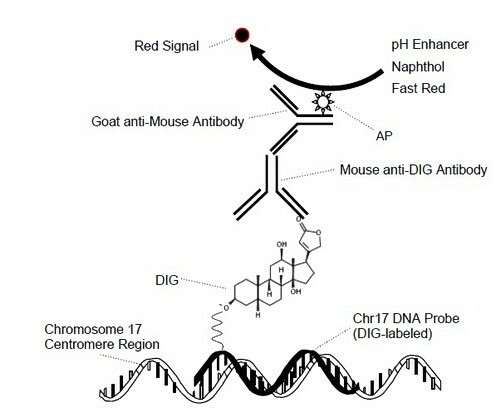 3- ultraView Red ISH DIG (digoxigenin) Detection Kit: detects chromosome 17 DNA probe sequence. Each detection kit uses: a chemical compound that labels the DNA probes, primary antibody, secondary antibody (HRP Multimer), enzymes, and a series of chromogen reagents. The principal steps of the procedure for both detection kits are illustrated in Figures 2 and 3. During the staining process, the DNP and DIG labeled probes are co-hybridized to their respective specific target DNA sequences (HER2 and chromosome 17, respectively) within the cell nuclei. Then detection of HER2 signals occurs first by ultraView SISH DNP Detection Kit, as a black intranuclear signal, followed by detection of chromosome 17 signals by ultraView Red ISH DIG Detection Kit, as a red intranuclear signal. The staining protocol was in accordance with standard dual ISH staining protocol of VENTANA- BenchMark-XT computerized automated system, the procedure roughly takes 13 hours to complete, it is briefly summarized in Table 1. The statistical analysis of this study was performed using SPSS 21.0 (Chicago, IL, USA) and Microsoft Excel 2013. Categorical data were formulated as counts and percentages. Chi-square and Fisher exact tests were used to describe the association of these data. The lower level of accepted statistical significant difference was below or equal to 0.05. The study included 52 female patients with invasive breast carcinomas. Their ages ranged from 31 to 81 years with 25 cases (48.1%) younger than 50 years and 27 cases (51.9%) aged 50 or older (Table 2). Concerning the types of invasive breast carcinoma that are included in the present work; the majority of cases (44 out of 52) were of invasive Ductal Carcinoma Not Otherwise Specified (IDC-NOS), comprising 84.6%. The remaining cases were: Invasive Lobular Carcinoma (ILC) (2 cases, 3.8%), mixed IDC-NOS and ILC (2 cases, 3.8%), medullary carcinoma (2 cases, 3.8%), ILC pleomorphic type (1 case, 1.9%) and invasive mucinous carcinoma (1 case, 1.9%) (Table 2). Immunohistochemical study of the cases revealed that half of the cases were ER positive (26 cases, 50%) (Figure 4) and the other half showed negative ER status, while cases with positive PR status were 27 (51.9%), and other cases showed negative PR immunoreactivity (25 case, 48.1%) (Table 2). Fig. 4. 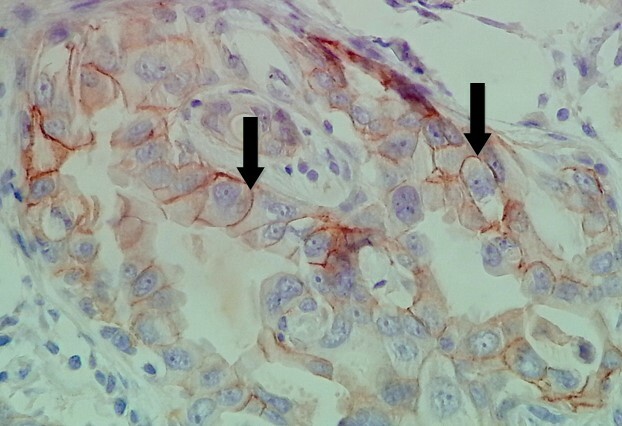 Invasive Ductal Carcinoma of Breast with Positive Brown Nuclear Staining (arrows) of Estrogen Receptor (ER) Immunohistochemistry of Score 8/8 According to Allred Scoring Method (20X). Fig. 5. 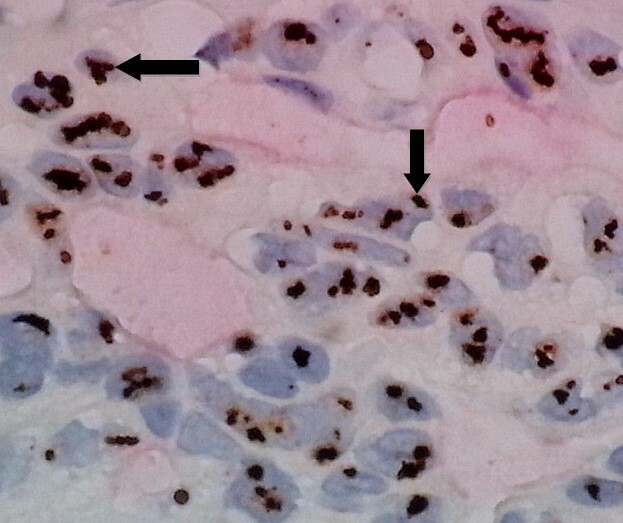 Invasive Ductal Carcinoma of Breast with HER2 Immunohistochemistry Score 2+ (equivocal) Showing Weak-Moderate Complete Circumferential Brown Membranous Staining (arrows) in >10% of Invasive Cancerous Cells (60X). Fig. 6. Invasive Ductal Carcinoma With Non-Amplified HER2 Gene by the Silver DNA in Situ Hybridization Technique; HER2 gene black SISH intranuclear signals (arrows) typically appear smaller than chromosome 17 red ISH intranuclear signals (arrow heads) with an overall ratio of (black SISH signals/red ISH signals) < 2 (60X). Fig. 7. 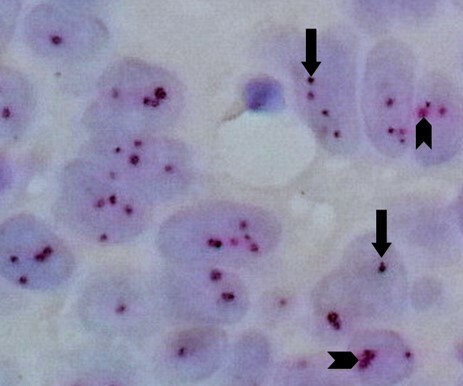 Invasive Ductal Carcinoma With Non-Amplified HER2 Gene by Silver DNA in Situ Hybridization (same case in Figure 6 with higher magnification); each carcinoma cell nucleus shows (on average) an equal number of HER2 gene black SISH signals (arrows) and chromosome 17 red ISH signals (arrow heads) with a ratio of < 2 (100X). Fig. 8. 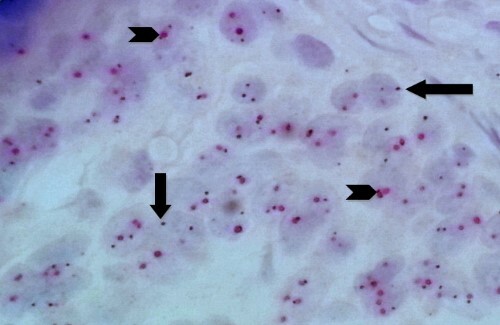 Invasive Ductal Carcinoma With Amplified HER2 Gene by Silver DNA in Situ Hybridization; HER2 gene black SISH intranuclear signals (arrows) typically appear smaller than chromosome 17 red ISH intranuclear signals (arrow heads) with an overall ratio of (black SISH signals/red ISH signals) > 2. (60X). According to age, HER2 gene status showed non-significant difference in age groups between cases with amplified and non-amplified gene status (P=0.173) (Table 3). The comparison of HER2 gene amplification according to hormone status revealed a significant negative association between positive ER and PR status and HER2 gene amplification by SISH in the studied cases (P= 0.002 and 0.017, respectively) (Table 4), however, the gene amplification status was not significantly different among types of invasive breast carcinoma (P=0.206) (Table 5). Precise evaluation of HER2 status is vital to optimize the outcome of patients with mammary carcinoma (7). Immunohistochemistry is sufficient for the initial HER2 assessment, but patients with tumors scored less than 3+ (particularly those interpreted as 2+) would benefit from FISH to assess HER2 status more precisely and to avoid erroneous prognostication and inappropriate management (8).Furthermore, FISH is a practically objective and quantitative method in detecting HER2 gene amplification on the nuclei of tumor cells. The drawbacks of this procedure are its high costs (10 times that of IHC), complexity, the need for a fluorescence microscope, the temporary signal (it requires a special camera), and its inability to perceive and evaluate tumor histomorphology (9). Technologies for HER2 testing include Chromogenic In Situ Hybridization (CISH) and SISH (10).Numerous earlier works have enrolled cases with HER-2 overexpression (IHC 3+) or HER2 amplification, and reported their correlation with high tumor cell grade, absence of ER or PR expression, DNA aneuploidy, and high Ki67 (11-13). The current study focused on invasive breast carcinoma cases with equivocal HER2 status by immunohistochemistry (score of 2+) further evaluated by SISH, and the relationship between HER2 gene amplification status and various clinico-pathological variables including (age, tumor type, ER and PR status) were assessed. Out of 52 cases of 2+ score of HER2 by IHC, 33 (63.5%) showed non-amplified HER2 gene; and (19 cases, 36.5%) revealed amplified gene status; the amplified gene status was negatively correlated with ER and PR positive expression. There was no significant association between HER2 gene amplification and age of patients or type of invasive breast cancer. To the best of our knowledge, very few published work are concerned with such group of patients (with equivocal IHC results of HER2) (4, 14-16). Lee et al. (14) considered a large number of cases with invasive breast cancer, among which 419 out of 1735 (24%) were of score 2+ HER2 by IHC. They reported that 14% (57/413) were HER2 amplified, according to FDA criteria (ratio of HER2 signals to chromosome 17 signals ≥2.0). Furthermore, HER2 amplification was related to the percentage of complete membrane staining. Chibon et al. (15)studied 108 breast cancer cases with score 2+ HER2 by IHC. Rate of HER2 amplification by FISH was 33%. Tumor grade and percentage of cells showing membrane staining were indicators of HER2 status. Dieci et al. (16) investigated 480 breast cancer tissues with 2+ HER2, revealing that high tumor grade and high Ki67 were signiﬁcantly associated with HER2 FISH amplification. Payandeh et al. (17) recruited females with breast cancer at the Oncology Clinic, Kermanshah, Iran. Of the 133 patients, 37 were classified as IHC 2+ and 96 were classified as IHC 3+. HER2 was found to be amplified by FISH in 12 out of 37 (32.4%) of the IHC 2+ cases while 25 (67.6%) of the IHC 2+ cases had HER2 FISH negative test results. The HER2 gene was amplified (positive) in 34.6% (63/182) by FISH, according to FDA criteria, and tumors with HER2 amplification were more likely to harbor ER negative or PR negative results (4). Wang et al. (18)conducted a recent work on 1036 females with breast cancers. The expression of hormone receptors and HER2 was studied by IHC, while FISH was used to determine HER2 status in cases scored IHC 2+. They suggested that the negative association between ER, PR and HER2 was age-related and only applied for females aged >40 years. There was a converse association between the expression of ER, PR expression and HER2 amplification in both preclinical and clinical studies (19-23). This inverse relationship has been connected with the fact that estrogen and its receptor are requisites to suppress HER-2/neu. ER and HER-2/neu signaling are inversely correlated throughout a transcriptional repression of HER-2/neu by estradiol binding to ER (24). Hormone receptors assessment can predict the effectiveness of hormonal therapy in mammary carcinomas (25). HER2-positive tumors have a higher association with ER and PR negativity (1, 26, 27). In positive ER cases, HER2 overexpression was indicated. Such cases have worse survival compared to those showing positive ER and negative HER2 tumors, signifying that HER2 status is a valuable interpreter of response to hormone therapy (28).Expressionof PR influences the possibility of HER2 amplification in cases with positive ER (21). A study concluded that HER2 amplification/overexpression was associated with lower ER/PR levels (19). Recently, a few articles have been published regarding outstanding effectiveness of the HER2 SISH method (29, 30). Concordance between FISH and SISH was 98.2% (31). Furthermore, FISH is considered a typical method for assessing of HER2 gene (32).However, disadvantages of this method include sophisticated analysis, fast fading of fluorescence, and lengthy procedure (31). Substitute techniques have been attempted (33). The CISH is a simple satisfactory method to recognize HER2 gene copies using steps similar to immunohistochemistry, ordinary light microscope and everlasting signal intensity (34, 35). Nevertheless, it is manually operated and time-consuming. Silver DNA in Situ Hybridization is automated and time efficient in addition to the use of ordinary light microscopy and permanent signal intensity (31). Around 12 to 13 hours is required to complete the SISH test, a time that is roughly half that of FISH and CISH, which require an average of 24 hours. More than half of breast carcinoma cases with equivocal HER2 immunoreactivity showed non-amplified gene status; this result is important to be taken into consideration by oncologists during their management planning of patients with breast cancer. Amplified HER2 gene is significantly associated with negative ER and PR status that affects patients’ management protocols and future outcome of the disease. Iraq Ministry of Health and College of Medicine /Al-Nahrain University are appreciated for support of this work. Ivkovic-Kapicl T, Knezevic-Usaj S, Djilas-Ivanovic D, Panjkovic M. Correlation of HER-2/neu protein overexpression with other prognostic and predictive factors in invasive ductal breast cancer. Anticancer Res 2007;21:673-8. Sińczak-Kuta A, Tomaszewska R, Rudnicka-Sosin L, Okoń K, Stachura J. Evaluation of HER2/neu gene amplification in patients with invasive breast carcinoma. Comparison of in situ hybridization methods. Pol J Pathol 2007;58:41-50. Panjwani P, Epari S, Karpate A, Shirsat H, Rajsekharan P, Basak R, et al. Assessment of HER-2/neu status in breast cancer using fluorescence in situ hybridization & immunohistochemistry: Experience of a tertiary cancer referral centre in India. Indian J Med Res 2010; 132:287-94. Ji Y, Sheng L, Du X, Qiu G, Chen B, Wang X. Clinicopathological variables predicting HER-2 gene status in immunohistochemistry-equivocal (2+) invasive breast cancer. J Thorac Dis 2014; 6:896-904. Jang JS, Jang EJ, Park J. HER2 expression in breast cancer: Comparisons of fluorescence in situ hybridization and silver in situ hybridization, and immunohistochemical staining using monoclonal antibody and polyclonal antibody. Basic Appl Pathol 2010; 3: 115–20. Powell RD, Pettay JD, Powell WC, Roche PC, Grogan TM, Hainfeld JF, et al. Metallographic in situ hybridization. Hum Pathol 2007; 38:1145-59. Perez EA, Cortés J, Gonzalez-Angulo AM, Bartlett JM. HER2 testing: current status and future directions. Cancer Treat Rev 2014; 40:276-84. 8.Kakar S, Puangsuvan N, Stevens JM, Serenas R, Mangan G, Sahai S, et al. Her-2/neu assessment in breast cancer by immunohistochemistry and fluorescence in situ hybridization: comparison of results and correlation with survival. Mol Diagn 2000; 5:199-207. Madrid MA, Lo RW. Chromogenic in situ hybridization (CISH): a novel alternative in screening archival breast cancer tissue samples for HER-2/neu status. Breast Cancer Res 2004; 6:R593-600. Penault-Llorca F, Bilous M, Dowsett M, Hanna W, Osamura RY, Rüschoff J, etal.Emerging technologies for assessing HER2 amplification. Am J Clin Pathol 2009; 132:539–48. Liu C, Zhang H, Shuang C, Lu Y, Jin F, Xu H, et al. Alterations of ER, PR, HER-2/neu, and P53 protein expression in ductal breast carcinomas and clinical implications. Med Oncol 2010; 27:747-52. Hanley K, Wang J, Bourne P, Yang Q, Gao AC, Lyman G, et al. Lack of expression of androgen receptor may play a critical role in transformation from in situ to invasive basal subtype of high-grade ductal carcinoma of the breast. Hum Pathol 2008; 39:386-92. Lee AH, Key HP, Bell JA, Hodi Z, Ellis IO. Breast carcinomas with borderline (2+) HER2 immunohistochemistry: percentage of cells with complete membrane staining for HER2 and the frequency of HER2 amplification. J Clin Pathol 2011;64:490-2. Chibon F, de Mascarel I, Sierankowski G, Brouste V, Bonnefoi H, Debled M, et al. Prediction of HER2 gene status in Her2 2+ invasive breast cancer: a study of 108 cases comparing ASCO/CAP and FDA recommendations. Mod Pathol 2009;22:403-9. Dieci MV, Barbieri E, Bettelli S, Piacentini F, Omarini C, Ficarra G, et al. Predictors of human epidermal growth factor receptor 2 fluorescence in-situ hybridisation amplification in immunohistochemistry score 2+ infiltrating breast cancer: a single institution analysis. J Clin Pathol 2012; 65:503-6. Wang B, Wang X, Zou Y. Association between hormone receptors and HER-2/neu is age-related. Int J Clin Exp Pathol 2015; 8:8472-9. Konecny G, Pauletti G, Pegram M, Untch M, Dandekar S, Aguilar Z, et al. Quantitative association between HER-2/neu and steroid hormone receptors in hormone receptor-posi­tive primary breast cancer. J Natl Cancer Inst 2003; 95: 142-53. Taucher S, Rudas M, Mader RM, Gnant M, Dubsky P, Bachleitner T, et al. Do we need HER-2/neu testing for all patients with primary breast carcinoma? Cancer 2003; 98: 2547-53. Huang HJ, Neven P, Drijkoningen M, Paridaens R, Wildiers H, Van Limbergen E, et al. Association between tumor characteristics and HER-2/neu by immunohistochemistry in 1362 women with primary operable breast cancer. J Clin Pathol 2005; 58: 611-6. Zhang H, Ren G, Wang X, Zhao J, Yao H, Bai Y, et al. HER-2 gene amplification by fluores­cence in situ hybridization (FISH) compared with immunohistochemistry (IHC) in breast cancer: a study of 528 equivocal cases. Breast Cancer Res Treat. 2012; 134: 743-9. Zeillinger R, Kury F, Czerwenka K, Kubista E, Sliutz G, Knogler W, et al. HER-2 amplification, steroid re­ceptors and epidermal growth factor receptor in primary breast cancer. Oncogene 1989; 4: 109-14. Russell KS, Hung MC. Transcriptional repres­sion of the neu protooncogene by estrogen stimulated estrogen receptor. Cancer Res 1992; 52: 6624-9. Donegan WL. Tumor-related prognostic factors for breast cancer. Ca Cancer J Clin 1997;47: 28-51. Prati R, Apple SK, He J, Gornbein JA, Chang HR. Histopathologic characteristics predicting HER-2/neu amplification in breast cancer. Breast J 2005;11: 433-9. Ansquer Y, Mandelbrot L, Lehy T, Salomon L, Dhainaut C, Madelenat P, et al. Expression of BRCA1, HER-1 (EGFR) and HER-2 in sporadic breast cancer and relationships to other clinicopathological prognostic features. Anticancer Res 2005; 25: 4535-41. Ariga R, Zarif A, Korasick J, Reddy V, Siziopicou K , Gattuso P. Correlation of Her-2/neu gene ampflication with other prognostic and predictive factors in female breast carcinoma. Breast J 2005;11: 278-80. Carbone A, Botti G, Gloghini A, Simone G, Truini M, Curcio MP, et al. Delineation of HER2 gene status in breast carcinoma by silver in situ hybridization is reproducible among laboratories and pathologists. J Mol Diagn 2008;10:527-36. Dietel M, Ellis IO, Höfler H, Kreipe H, Moch H, Dankof A, et al . Comparison of automated silver enhanced in situ hybridisation (SISH) and fluorescence ISH (FISH) for the validation of HER2 gene status in breast carcinoma according to the guidelines of the American Society of Clinical Oncology and the College of American Pathologists. Virchows Arch 2007;451:19-25. Kang J, Kwon GY, Lee Y, Gong G. Comparison of silver-enhanced in situ hybridization and fluorescence in situ hybridization for HER2 gene status in breast carcinomas. J Breast Cancer 2009; 12: 235-40. Pauletti G, Godolphin W, Press MF, Slamon DJ. Detection and quantitation of HER2/neu gene amplification in human breast cancer archival material using fluorescence in situ hybridization. Oncogene 1996;13:63-72. Wolff AC, Hammond ME, Schwartz JN, Hagerty KL, Allred DC, Cote RJ, et al. American Society of Clinical Oncology/College of American Pathologists guideline recommendations for human epidermal growth factor receptor 2 testing in breast cancer. J Clin Oncol 2007; 25:118-45. Hauser-Kronberger C, Dandachi N. Comparison of chromogenic in situ hybridization with other methodologies for HER2 status assessment in breast cancer. J Mol Histol 2004;35:647-53. Gupta D, Middleton LP, Whitaker MJ, Abrams J. Comparison of fluorescence and chromogenic in situ hybridization for detection of HER2/neu oncogene in breast cancer. Am J Clin Pathol 2003;119: 381-7.